January 17, 2019 (Chicago, Ill) — Vehicle owners looking for fast, unbeatable protection can rejoice as 303®Products, makers of a premium line of five-star rated auto detailing products, today announced the launch of 303®Touchless Sealant. Available now on 303Automotive.com and DetailedImage.com for $24.99, 303® Touchless Sealant (32 oz.) is a time-saving wax alternative with water-activated hydrophobic technology that lasts up to two times longer than traditional wax and doesn’t require wiping or buffing. 303® Touchless Sealant takes just minutes to apply, compared to the hour, or longer, process for traditional vehicle waxing, and offers immediate results, as water beads on the paint to indicate the vehicle’s paint is protected. The quick and easy-to-use spray and rinse product provides superior water-beading protection and a deep, long-lasting, glossy shine. It also prevents UV damage and will help to protect against light scratches. Providing up to six months of protection, 303® Touchless Sealant works on all exterior surfaces, including clear coat, gel coat, fiberglass, plastics, windshields, wheels, tires and trim. 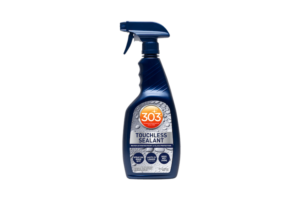 303® Touchless Sealant will be available in national online and brick-and-mortar retailers this spring. For additional information on Gold Eagle Co. and the new 303® Touchless Sealant, visit www.303Automotive.com. Founded in 1932, Gold Eagle® Co. is a family owned and operated company that is an industry pioneer in the production and distribution of performance chemicals and surface treatments. Gold Eagle Co. is driven to produce innovative products that protect and preserve the things we love and its award-winning line up of products, includes STA-BIL®, 303® Products, TriNova®, & HEET® Gas-Line Antifreeze. For more information please visit www.goldeagle.com.